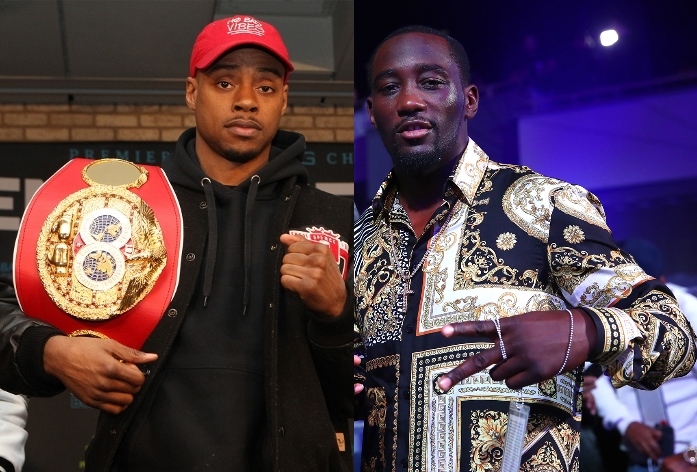 ARLINGTON, Texas – Errol Spence Jr. has no interest whatsoever in actively chasing a much-discussed showdown with Terence Crawford. Spence simply replied, “no,” when he was asked after his easy victory over Mikey Garcia on Saturday night if he’ll attend Crawford’s fight against Amir Khan on April 20 in New York. Like Crawford, Spence wants what would amount to the most appealing welterweight title unification fight. The unbeaten IBF welterweight champion realizes, though, that whenever the time is right for them to fight, Bob Arum and Al Haymon will have to get together to make a deal. Ultimately, that shouldn’t be an insurmountable obstacle, Spence said, because Haymon and Arum were able to make a deal four years ago for Floyd Mayweather Jr. to finally meet Manny Pacquiao. Mayweather-Pacquiao produced a record 4.6 million pay-per-view buys and more than $600 million in overall revenue. No matter how much longer Arum, Haymon and others attempt to build Crawford-Spence into a bigger event, it won’t come close to generating the type of profits Mayweather-Pacquiao produced. It is, however, one of the foremost fights fans want to see. Perhaps only the potential heavyweight showdown between champions Anthony Joshua (22-0, 21 KOs) and Deontay Wilder (40-0-1, 39 KOs) has generated more buzz among boxing enthusiasts than Crawford-Spence. The 29-year-old Spence expects to fight the 31-year-old Crawford, just not next. The DeSoto, Texas, native does seem optimistic that their teams eventually will figure out a way to do a co-promotion and a joint pay-per-view venture. The 40-year-old Pacquiao (61-7-2, 39 KOs) attended the Spence-Garcia fight. The Filipino superstar suggested following Spence’s win that he would fight the taller, stronger southpaw later this year at AT&T Stadium, the home of the Dallas Cowboys. Pacquiao could decide to fight Thurman (29-0, 22 KOs, 1 NC) in his next bout. A Pacquiao-Thurman match could leave Spence (25-0, 21 KOs) to box Porter (30-2-1, 17 KOs) in a 147-pound title unification fight for Spence’s IBF title and Porter’s WBC crown. England’s Khan (33-4, 20 KOs) will challenge Crawford (34-0, 25 KOs), of Omaha, Nebraska, next month for Crawford’s WBO welterweight title in an ESPN Pay-Per-View main event from Madison Square Garden. If it were up to Spence and Crawford alone I think the fight would be made already. However Crawford being signed to a promoter makes it more complicated.